Afognak was devastated by the earthquake and tsunami of 1964. 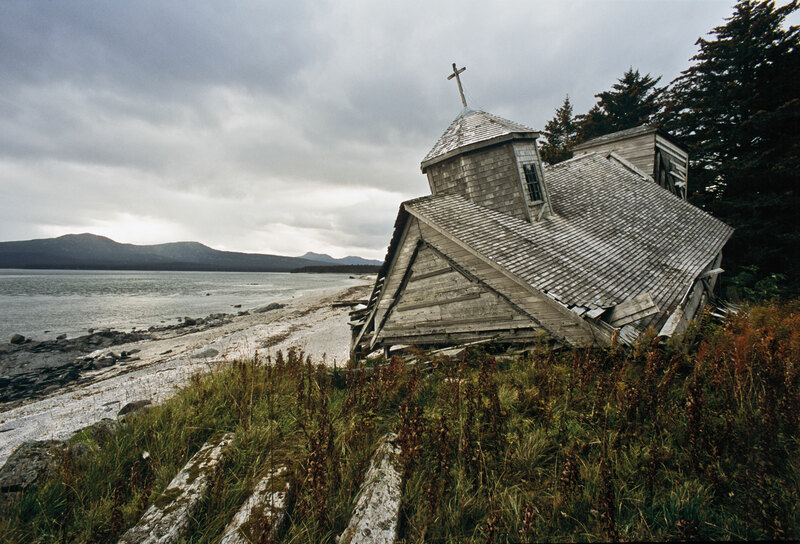 The 1964 Alaskan Earthquake, also known as The Great Alaskan Earthquake, began around dinnertime on March 27th – Good Friday. Emil and Frieda Norton and their children had just sat down to eat when the light in the ceiling began to sway and the table shook violently. “We all jumped up and ran outside. We hung on to each other, because if we didn’t we would have fallen to our knees – it was shaking so violently. The asphalt in front of our house was rolling in two to three feet waves,” Emil told me. We had gathered at Gene and Phyllis Sundberg’s home to talk about their Scandinavian heritage, when the conversation drifted to the earthquake. According to testimony, the entire town of Kodiak rolled, as if carried by a gigantic wave that lifted buildings up in the air and then lowered them again. Lasting almost four minutes, the earthquake was one of the most powerful ever recorded, reaching a magnitude of 9.2 on the Richter scale. “I recall the mountain looked like a bear’s stomach, breathing out and in, and moaning. When I explained this to the scientists that came later, they said it was just my imagination,” Phyllis muttered derisively. “You had to see it to believe it,” added Frieda. “We thought it was the end of the world. We stood in a ring holding on to each other, praying the ‘Our Father’,” said Gene. “Now we have a lot of toilet paper stored up in the attic waiting for the next tremor,” laughed Gene. The first Tsunami wave hit less than an hour later, destroying the entire harbor area, the canneries, and the shops along Main Street. The highest waves that swelled in over the city crested at 30 feet. The waves that destroyed Old Harbor and Afognak Village were an estimated 45 feet. “We could hear buildings being crushed. I was looking through field glasses, focused on the Orpheum Theater, when all of a sudden, a boat sailed right past the window. I was so shocked, I screamed and threw the binoculars across the room,” Phyllis remembered laughing. The fishing industry was hit the hardest – fishermen lost their boats and canneries were destroyed. Nearly a year went by before the cannery where Emil Norton worked partially reopened. “Kodiak has a long and unique history. You know, despite the volcanoes and earthquakes, there is no better place to live,” concluded Emil. The powerful earthquake triggered a series of tsunami waves that washed over Afognak, the second largest island on Kodiak archipelago, destroying most of the village Afognak. The ground sank six feet in some places, and wells and lakes were contaminated by salt water. The people of Afognak faced a difficult decision – rebuild or relocate. The decision to relocate passed by one vote. The new village, built in a more protected location in Kizhuyak Bay, was named Port Lions. An eerie silence engulfed the decaying village when I last visited Afognak village. Plates and cups were left standing on kitchen tables, and knickknacks lay helter-skelter on the shelves. The schoolhouse that once echoed with the laughter of children, stood silent and empty. The church lay toppled on the beach, and the graveyard, with all the graves, had been washed away by the waves. In a few years, what was left of the village will be overgrown by vegetation or buried under the sand. Excerpt from the book “Kodiak, Alaska – The Island of the Great Bear” which can be purchased here. At the Kodiak Scandinavian Culture and Film Fest November 6-12, 2017 I will be showing films from my 30+ years on the island. Don’t miss the film Good Friday 1964. See festival site for more information. Kodiak Scandinavian Culture & Film Fest a Big Success!